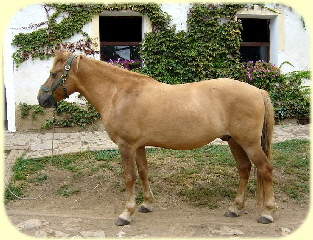 Hucul Club - an organisation to save the threatened hucul horse breed - was founded in 1972, when only some 300 purebred individuals remained on the planet. The goal of the Club, an association of volunteers and enthusiasts, has been to preserve the breed and find it a new use and reason for existence in the modern world. The guiding principle of Hucul Club is education towards a friendship between man and animal, the ideals espoused in The Great Law. If you would like to support the Hucul horses or the work of Hucul Club, please contact us. Financial contributions may be made directly to the account number. Thank you for your support. There are still several purebred hucul horses available for sale from the Hucul Club stud! (such as Uran, photo on the right) and others named on the advertisements page) Interested parties may click on their names to see details. Or get in touch with us (see the Contact). 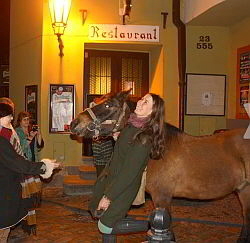 from Radotín to Neumětely, to the grave of the famous horse of Czech legend. In addition to the historic (or legendary, anyway) mount of Thain Horymir, we shall also commemorate his namesake (photo on the left), who passed away last July in Winnipeg, mourned and fondly remembered by our own webmaster. More details about the ride will follow, watch this website. The celebration of the 40th anniversary of founding of Hucul Club was a roaring success. More than 200 people participated, congratulations - both to Club itself and to Ralf's 87th birthday - came from far and wide, and everybody had a grand old time. Some of the media responses are linked from the Czech [older news] pages. And the last term of this year's camps for children started. May it be just as successful! Following successful conclusion of the second term of the camp, we welcome an international team of helpers at Zmrzlik. The participants came from far and wide: Norway, England, New Mexico, Lebanon. The get-together is organized by the Czech International People´s Project - part of the CISV International (www.cisv.org). The project has its own website, including a photo gallery, at http://czechipp2012.webnode.cz/ . We wish them all a pleasant sojourn and lots of useful work accomplishments.